I’m a sucker for lemons. When my meyer lemon tree died a few years ago I was gutted. That particular tree kept us in lemons all year round. It was huge and bountiful, and then it died. I need lemons on a daily basis. I use the juice and zest in dressings, tarts, cakes, salads, curd, mixed peel, preserved lemon, lemon drinks, marmalade, apple pies, stews, not to mention my summer fave gin and tonic. So I planted replacements. Not one, not two but three lemon trees. Two meyer and one lisbon just to make sure I had all seasons covered. In the time of my lemon drought I was always on the hunt for home-grown lemons and would freeze whole lemons, as well as small jars of juice and rind. I never knew that you could freeze them whole but you can and it’s quite brilliant. You can grate the zest while frozen and then juice them once they have defrosted. Genius! 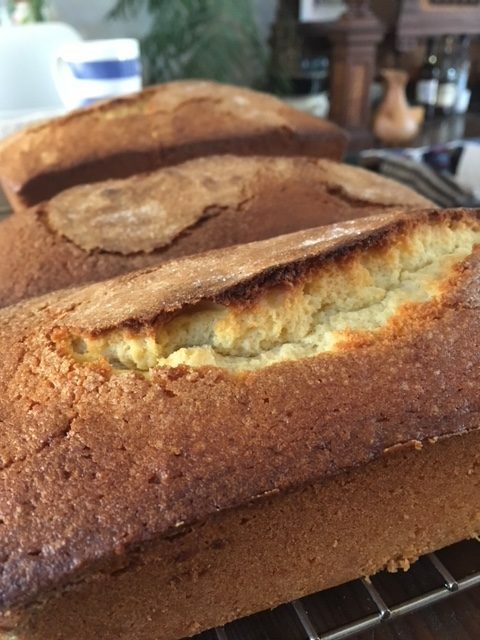 This lemon madeira cake is one I make regularly. It’s moist and dense and very lemony. When I have an abundance of eggs and lemons I will make a few batches in one go and freeze them. They seem to improve after being frozen. We frequently have workawayers staying and I like to have cakes in the freezer that I can bring out to keep the tins full during their visit. I can’t take any credit for the recipe. It’s one of Nigella’s, or at least her mother-in-law’s however I have changed it up a little. Ingredients; 240 grams butter, 200 grams sugar (plus a little extra for sprinkling), grated zest of one very large lemon (or 2 small ) and the juice thereof, 3 large fresh eggs, 300 grams unbleached white flour, 2 rounded teaspoons baking powder. Method; Butter and flour a loaf tin and preheat oven to 170F. Cream thoroughly the butter and the sugar till pale and smooth. Mix in lemon zest then the eggs one at a time (add a little flour with each addition to keep the mixture smooth). Gently mix in remaining flour and baking powder then lastly the lemon juice. Place batter into the prepared tin and sprinkle top with the remaining sugar before placing into the preheated oven. Bake for about 1 hour or until a cake tester comes out clean. Cool for 10 minutes before removing from the tin and cooling on a cake rack. Enjoy!